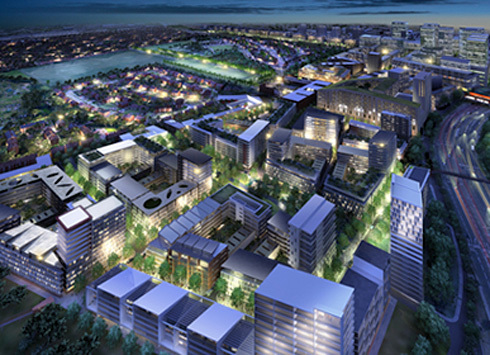 Vole O'Speed: Brent Cross Cricklewood regeneration scheme "dead"
Brent Cross Cricklewood regeneration scheme "dead"
Mr Johnson met key figures at Brent Cross last week and one source told the Standard that the wider Cricklewood regeneration scheme was now "dead in the water". The Mayor is now thought to favour concentrating efforts on what would be dubbed Brent Cross "town centre", the mall, which opened in 1976, and the retail park on the opposite side of the North Circular, in the face of competition from Westfield. The huge "regeneration" scheme, the biggest in London, championed by Barnet Council, attracted more than 500 objections: amongst them being those of Brent and Barnet LCC groups, many other local environmental groups, and all Barnet's surrounding borough councils: Brent, Harrow, Camden and Haringey, who were all very worried about the generation of more traffic on their roads – Barnet's own (unrealistically conservative) estimate was for an extra 29,000 cars per day. Cyclists were most concerned about the developers' plans to make Staples Corner even more of a cycling barrier, by creating a giant dumbbell-shaped gyratory linking the Staples corner east and west roundabouts, through the Midland railway viaduct, and forcing cyclists on the A5 either over the flyover, with its terrifying motorway-style slip-roads, or onto a slow, convoluted, ramped cycle path (the original developers' idea was that this cycle path should actually use lifts!!). The developers' 2008 plans showed this incredible proposal for the Staples Corner junction of the A5 Edgware Road, an LCN+ route and an important (unavoidable) commuting route for cyclists, with the North Circular Road, replacing the current roundabout (shown grey underneath). Cyclists were supposed to go south by taking a cycle path with lifts at either end, but no option was provided for going north! The Broken Barnet blog has an interesting take on the curious fact that news of this collapse happened to come out on the same day that Boris Johnson visited Barnet. It may be that Johnson, facing re-election, realised that many Conservative voters in north-west London opposed the heavily car-dependent scheme and the waste incinerator (AKA Combined Heat and Power Plant) that went with it. It may just be that everybody knows that, with the collapse of retailing, there would not now be enough money from the shopping centre development to finance it. 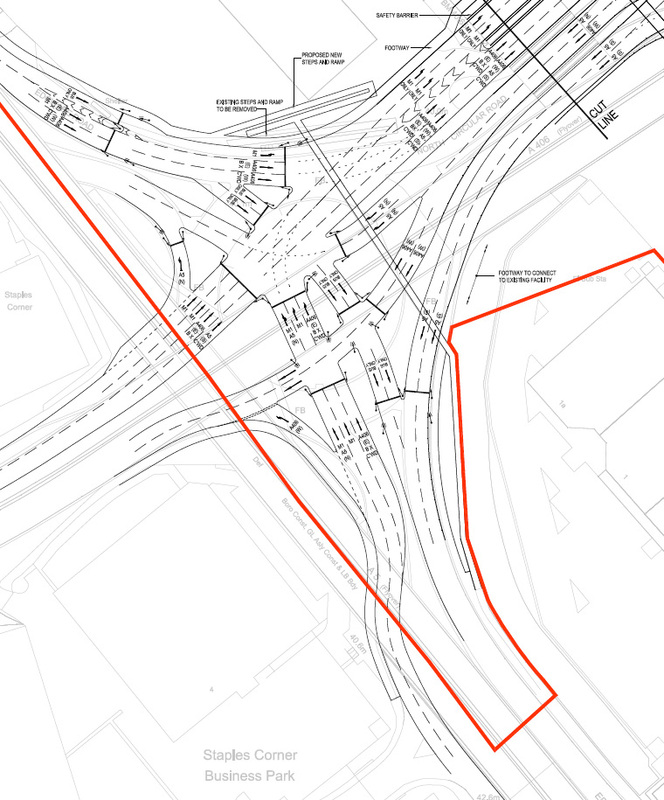 Whatever, the supposed forthcoming wider regeneration of the Brent Cross Cricklewood area has been used for years to block proposals to improve the A5 and Staples Corner for cycling. Now this regeneration looks unlikely to go ahead, this should no longer be an excuse. Personally, I am not opposed to shopping malls. They have considerable advantages in usability over a traditional high street for many, including the disabled. I am even not opposed to a further development of Brent Cross, if the developers think they can make it pay in this age of internet shopping. Shopping malls are not intrinsically bad – but what is key is to get the transport planning around them right, to make it easy for people to use alternatives to the car, an area where this development plan fell far short. And north Cricklewood could do with a certain amount of regeneration. But what it did not need was a huge land-grab by one consortium, in unholy hoc with a local council, determined to build a new high-rise city based on a nightmare 1970s concept of car-based urban planning, with pedestrians relegated to walkways in the sky, no sensible routes for bikes, a bus station made less convenient for the shopping centre than the present one, and no orbital rail or tramway. Hopefully that concept really is dead. There was, anyway, obviously never any milage in the idea of trying to create a "new town centre" straddling the North Circular Road. Such urban motorways can only ever divide. Barnet LCC now have an active campaigns group. They will be having a meeting this Friday at Middlesex University in Hendon – see their website for details. 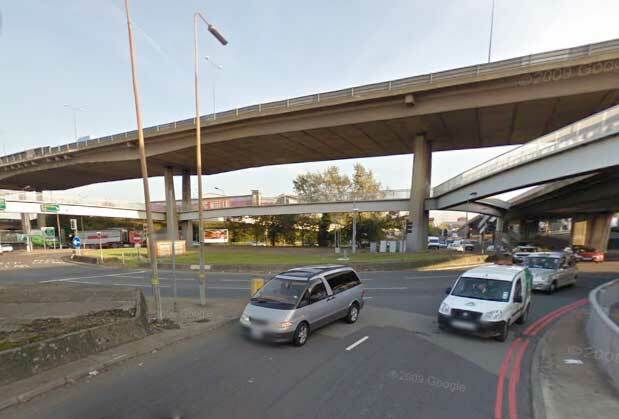 Actually, the two southbound lanes on the A5, shown in your picture, were removed in a later plan for the junction. That was because the junction could not handle the amount of traffic that Brent Cross would generate. Southbound A5 traffic was already unable to turn westbound on the North Circular Road. The new plan also meant that southbound A5 traffic was forced to turn left, pass underneath the railway, go around the rebuilt junction at the bottom of the M1 motorway, and come back again. Yes you are correct, well-spotted. The drawing I have shown is not the most recent plan, which made N to S impossible on the A5 except using the flyover. The trouble is all the main flyovers in the area were built in the 1970s for motorway-speed traffic. And at least some traffic does indeed drive at motorway speeds.